You are here: Home > Detox and Cleansing, Raw Food > A Fresh Start in 2010? A Fresh Start in 2010? First of all a big happy new year to you! I’m really looking forward to 2010. I’ve got a 3 new projects that I will launch this year. 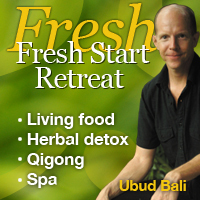 The first new project is my upcoming Fresh Start Retreat. I decided to create this retreat because, simply put, there was nothing else out there like it. What I’ve done is combine a living food detox program with the power of a form of Qigong called the “Bone Marrow Cleanse.” It’s been used by centuries for martial arts experts to clear and strengthen their energy fields. I have just come across your Udud retreat in march 2010. Are you going to do another one?